Samsung recently announced the Samsung GALAXY Ace Plus which is the upgraded version of the Samsung GALAXY Ace. Few of the highlighted features of Samsung GALAXY Ace Plus are 1GHz processor, 3.65 inch HVGA display, 3G HSDPA 7.2 Mbps connectivity, WiFi 802.11 and 2GB storage capacity. 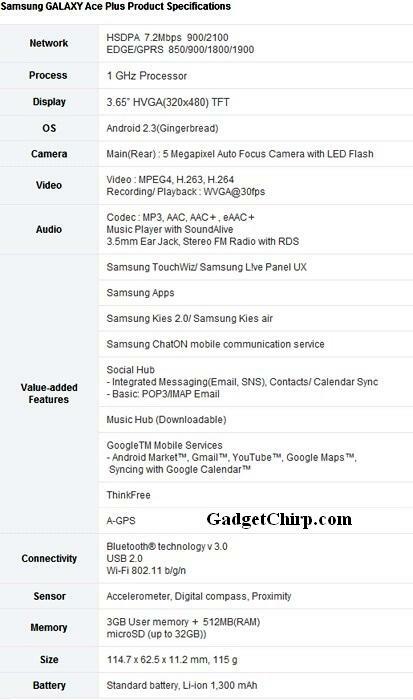 The full specifications and features of Samsung GALAXY Ace Plus are given below.